Attention Shoppers: Low Prices on Shots in the Clinic Off Aisle 7, by Milt Freudenheim, NY Times: Everyday low prices on strep-throat exams. That is the basic idea behind a retail approach to routine medical care now catching on among consumers and entrepreneurs. At Wal-Mart, CVS and other chain stores, walk-in health clinics are springing up as an antidote to the expense and inconvenience of ... doctors' offices or ... high-cost ... emergency rooms. For a $30 flu shot, a $45 treatment for an ear infection or other routine services from a posted price list, patients can visit nurse practitioners in independently operated clinics set up within the stores — whose own pharmacies can fill prescriptions. "It was a lot easier to know you can just drive up the block to a clinic, rather than spend time in the pediatrician's waiting room," said Liz Lyons, who recently brought her 9-year-old son to have a sore throat swabbed in a clinic at a CVS drugstore... She made a $10 co-payment, with her husband's insurance picking up the rest of the $59 tab. 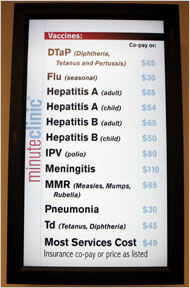 And most insurers so far are welcoming retail clinics as a way to save money. The uninsured, meanwhile, typically find the clinics more affordable than most alternatives — including the for-profit storefront clinics that have long offered a full range of physician-provided medical services to a walk-in clientele. [T]he retail clinic trend comes in response to an erosion in employer-sponsored insurance benefits that is forcing people to pay more or all of their own health costs. It is also a reaction to the growing perception that conventional medical service for routine and preventive care has become too costly and inefficient. "Starbucks has 10,000 locations; health care is certainly more important," said Mr. Case, who made his name and fortune on the Internet but is now betting that his chain of RediClinics at Wal-Mart, Walgreens and other retailers can be the next big thing. Mr. Case says his epiphany came a few years ago when he took his young daughter to an emergency room on a Sunday for an ear infection. "We waited four hours and they just weren't able to see us," he recalled. "This is crazy: a society in which everything is convenient other than what people care most about, which is taking care of their health." Mr. Case's company, Revolution Health Group, has 11 RediClinics now running... He plans to open 90 others in various retail chains by the end of this year, and 500 within three years. The licensed nurse practitioners who run most of the clinics typically have advanced training and referral arrangements with local doctors for cases beyond the clinics' scope. ... For Beth Brauning, 54, a self-employed house cleaner who is uninsured, the prices at a clinic in a CVS ... were a big attraction. The nurse practitioner took her blood pressure and wrote two allergy prescriptions she needed. The bill was $49 — "probably half what my doctor would have charged me," Ms. Brauning said. "It was such a good experience for me. You go to an emergency room, it's $300 to walk in the door."